Each color can be identified in different terms or formats when used in web applications or projects. For example: white color can also be displayed using code (#FFFFFF). Similarly, every color has specific and unique color name, RAL, RGB and HEX value. HEXelon RAL Konwerter is a small utility that show different codes for various colors. 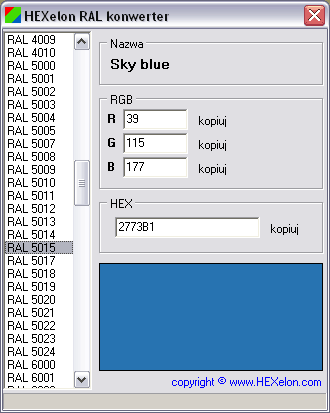 You can click and select RAL value on the left and see related color name, RGB and HEX codes. Very useful if you are looking to use different ways to display same color in RGB, HEX or RAL terms. Download HEXelon RAL Konwerter, it is a small exe file and does not require installation. RAL is a color matching system used in Europe. In colloquial speech RAL refers to the RAL CLASSIC system, mainly used for varnish and powder coating.